While the New York Knicks and Los Angeles Lakers have looked terrible over the last two years and won’t make the playoffs again this season, this drought in wins and success won’t last forever. There’s a light for both franchises at the end of the tunnel. 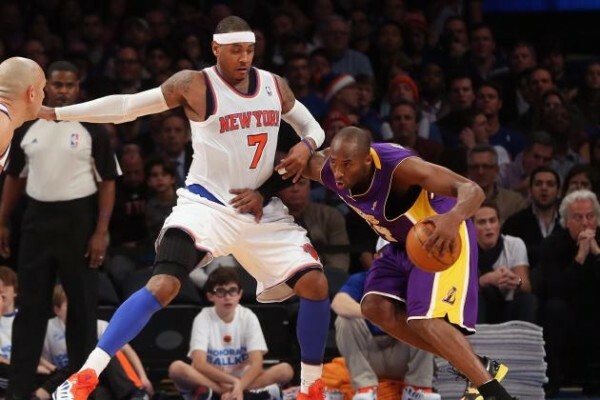 The Knicks and Lakers aren’t similar franchises. They both represent the biggest TV markets in the United States, but that’s it. The Knicks have two championships. The Lakers have 16. While the Knicks’ run of 14 consecutive playoff appearances, including two NBA finals and three more conference finals (1988-2001) is almost like a golden era for them, the standards for success are different for the Lakers. They’ve missed the playoffs two years in a row, something that hasn’t happened to the team since the mid 1970’s. In my opinion, which I’ve written about a number of times, the road to healing and improving begins the moment Kobe Bryant leaves the team. It’s not just his contract that’s choking the Lakers. It’s his presence. For the first time in a while there’s optimism which has solid ground to base on. No, the Lakers won’t come close to making the playoffs this season. But there’s young talent to watch develop, while Bryant is entering the final season of his contract; probably his final year in the NBA. It’s different for the New York Knicks, although with similarities. Carmelo Anthony isn’t Kobe Bryant, but he’s another leading man who’ll never win an NBA championship as the number one player on the team. At least he’s never gotten a team close except once (2009) when the Denver Nuggets made the conference finals. He has just one more playoff series win in his 12-year NBA career. The Knicks made some pretty decent moves this offseason. Nothing to be too chirpy about, but it both makes them better right away and doesn’t tie them down with long-term, bad contracts to old players. Robin Lopez, Arron Afflalo, Kyle O’Quinn and Derrick Williams will all make the Knicks better and at least respectable next season. That’s something considering how low they reached last season. Picking it up from here – making the right decisions and becoming a place free agents want to land in, is the next step. The NBA is a cyclical league, although some teams find it very difficult to escape failure (Minnesota Timberwolves, 11 years and counting since their last postseason) and others manage to prolong success in almost unnatural ways. The San Antonio Spurs will always be the answer to that trivia question. There are other issues besides personnel. Is Byron Scott actually an NBA coach who can do something other than oversee a team losing and losing? Is Derek Fisher just a Phil Jackson hand puppet or a capable head coach, beginning his road towards great things? When the Lakers and Knicks sort that one out, maybe the transition from bottom feeders to contenders will be a little bit smoother and shorter.